I just discovered a new feature of Google. 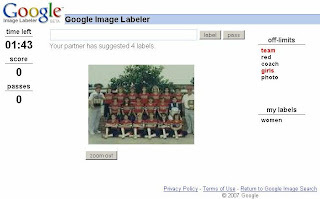 It's a simple word game that Google provides online, called Google Image Labeler. It has a simple concept, yet is addicting in terms of gameplay. When you join the game, Google will find you an online partner and both of you will be given 2 minutes to look at a series of images, wherein both of you have to describe it. You can type as many keywords or phrases describing the image. If both of you come up with a match, you both score points and you proceed to the next image. If you think you're taking too long on one image and both of you can't come up with a matching keyword, you can pass and your partner will be notified so they can pass too and proceed to the next picture. You can play as a guest or log on using your google account so points will be accumulated under your name. It's a nice game, and very ingenious of Google turning a tedious task into a game. If this were a task someone would do, they'd find it monotonous and boring. But since it was presented in a gaming aspect, it adds much fun to the task, not to mention, bringing in a whole lot of gamers who in turn double as volunteers for labeling images. The concept of pairing with another person on the internet, makes the keywords more credible cause of the keyword matching. You can type in bogus keywords and incorrect descriptions all you want but as long as it doesn't match the same keywords your partner is entering, then it won't be accepted as a keyword. Since images are visuals, it can't be fully categorized, classified nor comprehensible by a computer program. Even with Artificial Intelligence, it may not provide accurate results. Describing images needs the complex human mind to interpret it. And what better way to do it in the form of a game. Play, have fun and help Google all with this game! What a great strategy ! That's what is so great about it... google making life easier for them, hiding behind the scenes of a game. Now if I could only find a way to make people work for me for free too... mwehehehehe! hehehe. na-addict ako dito about 2 or 3 weeks ago! now, whenever I'm bored, I "play" this!